The new observation tower being built by the DNR on the state's highest point will provide visitors with breathtaking views. All three of us were old enough to know better than to be doing what we were doing. 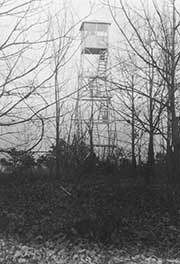 Nevertheless, there we were - twenty feet up in the air, climbing the rickety, weather-worn stairs of the old Sassafras Mountain fire tower. Someone had told my Uncle Fletcher that the view from the fire tower, straddling the state line and perched atop the highest point in South Carolina, was something to behold, the kind of thing that you would never forget. And there was more. Uncle Fletcher had also been advised that the abandoned tower was going to be dismantled, and when that happened, no one would ever again be able to enjoy that unique view. 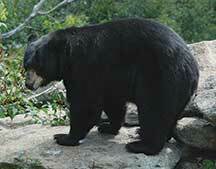 The peak of Sassafras Mountain is encircled by a dense forest of tall trees, so without something to get you up above them, you can't see more than about fifty yards. By the time Fletcher had called me about this once-in-a-lifetime opportunity, he had already called his cousin, Clifford Masters, and suckered him into coming along. So there we were, twenty feet up in the air and another fifteen or twenty to go. Despite the fact that we were starting to get the heebee-jeebies, (or the "jelly legs," as my wife puts it), we ascended the last few steps. It really did not bother us one little bit when we discovered that the hatch door through the floor of the tower watchman's cabin was padlocked. We had climbed far enough. What happened next is permanently recorded in the deep recesses of my cerebral memory banks. It was a slate gray February day, and when I looked out to take in the view, I was truly overwhelmed. It was too much to take in at one time. 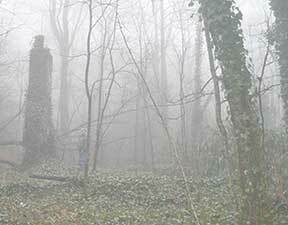 We were well above the trees and could easily see forty or fifty miles in every direction. We could see the stark white cliffs of Whiteside Mountain, way up near Highlands, North Carolina. In the foreground, seemingly at our feet, was Indian Camp Mountain, where Cherokee hunters once gathered for their annual deer drives. 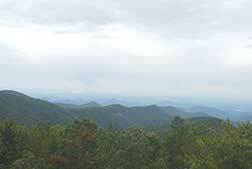 Off in the distance was the prominent peak of Mount Pisgah, easily forty miles away on the Blue Ridge Parkway. Looking to the east, we spotted something most folks never get to see, Governor's Rock, on the backside of Table Rock Mountain, where in the 1840s, both antebellum governors of the two Carolinas sought shelter from a sudden thunderstorm in a cleft of the outcropping. A little west of Table Rock stood the prominent peak of Pinnacle Mountain, where long before the first Europeans reached the shores of Carolina, Native Americans carved hundreds of ancient symbols in stone. To the south, Lake Keowee trailed off down from the mountains toward Clemson, its clear blue waters spilling into the valleys and coves of the rolling hills as if Judaculla, the Cherokee giant of myth and legend himself, had poured a huge bucket of mountain spring water over the landscape. Looking west we could see Big Laurel, Cane and Diana mountains, the chain of ridges that rise above Lake Jocassee and the very heart of the Jocassee Gorges. Beyond that we could discern the impressive Chattooga Ridge rising up from the foothills near Walhalla. And farther still, a brown, green and gray tapestry of mountains and ridges and valleys lay before us in bold relief, all the way to Currahee Mountain in Georgia. And then, as if to punctuate the whole experience, it started to snow. Dime-sized flakes drifted down as we sat there silently on our lofty perch. If someone had seen us from a distance, they might have mistaken us for three over-sized owls, rotating our heads from left to right, attempting to take it all in. We assumed that we would never again be able to see what we were seeing. Our eyes became cameras that day, each blink of the eye a click of the shutter, each image duly recorded for posterity. We had barely spoken during our short time up on high, except to agree that it was a real shame that they were going to tear down the old tower; everybody ought to be able to see this. Well the Sassafras fire tower was indeed torn down, just a few months later, but there is good news for all those who never ventured to climb it. At some point in the not too distant future, that impressive, one-of-a-kind vista is going to be restored, and more importantly, it will be open to the public. Plans are in the works to construct a safe and secure public-access observation tower on the peak of Sassafras, where the old fire tower once stood. And for those who are unable to climb the tower, whether through physical disability or simply because they tend to get the "jelly-legs" at great heights, ground-based vistas will be opened up at various points on the mountain. There is already a paved road to the project area and a gravel parking area located just below the peak, a popular drop-off and pickup point along the seventy-seven-mile-long Foothills Trail. Long-range plans call for construction of restrooms, picnic tables and a handicap accessible trail to the observation tower, with interpretive panels explaining the natural and cultural history of Sassafras and the surrounding area placed all along the way. 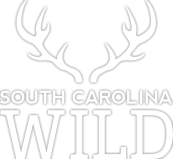 Local tourism officials anticipate that Sassafras will become a popular destination for folks from all over South Carolina and throughout the region. After all, most of us who grew up in South Carolina learned in school that Sassafras is the highest point in the Palmetto State, yet few outside the Upstate have ever been there, and even fewer have been able to enjoy the compelling vista from the peak. 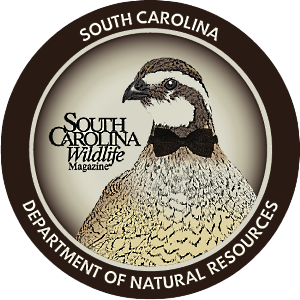 The concept for this project dates back to the early 1990s, when the S.C. Department of Natural Resources acquired the property now known as the Jocassee Gorges. At that time, the agency's chief negotiator in the acquisition process, John Frampton, committed to one day building an observation tower on the mountain, but for a number of reasons, it never materialized. 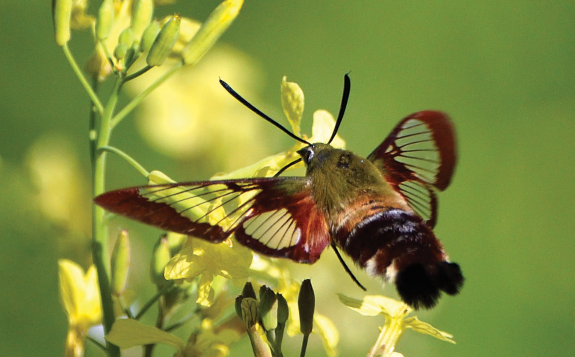 The project took on a new life when, in 2010, a group of local citizens along with representatives of the DNR and other nature-based organizations began meeting to see if the idea of a tower was still feasible. The group quickly realized that a suitable observation tower was going to be an expensive, time-consuming proposition and began to explore whether there might be other short-term things that could be done to enhance the Sassafras experience in the meantime. An idea emerged of providing a vista from the parking area, and within a week of that meeting, the DNR had taken the bull by the horns. They cleared trees and constructed a viewing platform just off the end of the parking lot. The response was huge. People literally flocked to the new overlook once word spread that something was going on "up on Sassafras" and that you could actually see something beyond the parking lot. Interest in the project finally began to take off. Good things began happening in rapid succession. Committee member and Pickens County Administrator, Chappell "Chap" Hurst, agreed to ask the Pickens County Council if they would provide some seed money. Pickens County agreed to repave much of the pothole-ridden road up to the top of the mountain, a welcome improvement for both locals and visitors. 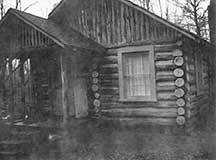 Two members of the committee, Kent Dykes, then CEO of the Easley Chamber of Commerce, and Sid Collins, Director of the Pickens YMCA, had fielded some complaints from members of a national organization called The Highpointers Club, who make it their quest to visit the high points in various states. Many "Highpointers" had been disappointed that there was no marker or any sort of interpretive material to denote the highest point in South Carolina. Collins worked with the club to get a bronze marker mounted on a boulder at the high point. The boulder and plaque were put in place in the fall of 2012. But a last impediment to building an observation tower, apart from fund-raising, remained. The DNR did not actually own the North Carolina portion of the mountain peak that would be essential for locating the tower on the highest point. Tom Swayngham, regional wildlife coordinator for the agency, explains what happened next. 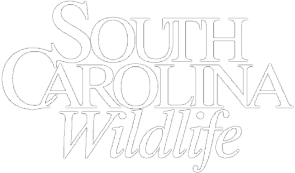 "The Conservation Fund, a national conservation organization, acquired the adjacent property and agreed to donate 4.9 acres on the North Carolina side of the state line," says Swayngham, "which will allow construction of the tower and other amenities." That critical donation by The Conservation Fund was a wonderful turn of events and removed the primary stumbling block for the project. Of course there is still the fundraising aspect, and that is no small consideration. The estimated cost of the tower is in the range of $750,000. 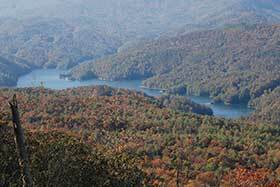 Mark Hall, the DNR's land manager for the Jocassee Gorges, has taken on the task of coordinating the fund-raising effort and implementing the development plan. "We wanted every South Carolinian to have the opportunity to participate in this landmark project, so we decided to offer brick pavers via the Internet," says Hall. "The Harry Hampton Wildlife Fund jump-started the project with a $25,000 donation, and we have roughly $70,000 right now. I hope we can raise the money in a year, but it might take longer. If we can find a couple of major contributors to step up to the plate, we'll be well on the way to a groundbreaking." 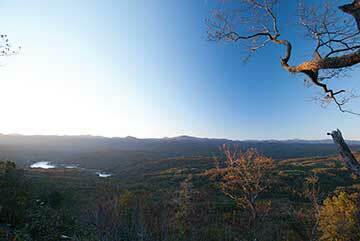 "Seeing the world from Sassafras Mountain with a three-hundred-and-sixty-degree view will give people an awesome perspective of South Carolina's mountain landscape and open a new door for those in search of wild land, wild things, adventure, and of course, true peace and quiet," adds Hall. "The view will help people appreciate how the fifty-square mile Jocassee Gorges was a key piece to the puzzle for land conservation and biological integrity." One of the most intriguing features on Sassafras Mountain is located on the Caesar's Head hiking trail, not far from the parking lot. It's what geologists and hydrologists call a tripoint, a divide that separates three different watersheds. There is a spot on the right side of the trail as you start to descend into Sassafras Gap where you can stand in one place and throw a rock into all three of those watersheds. 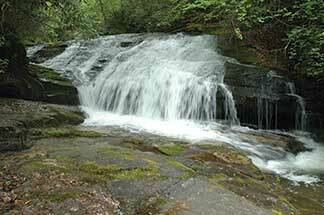 When rainwater drains off the eastern side of Sassafras Mountain, it ends up in the South Saluda River, which merges with North and Middle Saluda rivers before flowing through lakes Greenwood and Murray and making its way to Columbia, where it mixes with the waters of the Broad River to form the Congaree. The Congaree joins the Wateree River downstream, forming the Santee River for about five miles and then flowing into the Santee-Cooper lakes. That runoff water from Sassafras eventually ends up in the Atlantic Ocean, either through the Santee River south of Georgetown or through Charleston harbor by way of the Cooper River. When water flows off the south side of the mountain, it drains into Eastatoe Creek, through lakes Keowee and Hartwell, down the Savannah River and into the Atlantic near Savannah, Georgia. Water flowing off the north side and part of the western side of the mountain ends up in the French Broad River. The French Broad flows past Rosman, Brevard and Asheville in North Carolina and then to Knoxville, Tennessee, where it merges with the Holston River to form the Tennessee River, which eventually converges with the Ohio River at Paducah, Kentucky. From there, the Ohio River flows into the mighty Mississippi at Cairo, Illinois, and ultimately into the Gulf of Mexico at New Orleans. 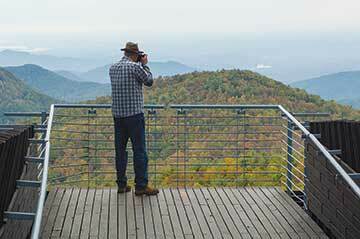 Folks who ventured to climb the old fire tower that once stood on the peak of Sassafras Mountain use words like "magnificent," "compelling" and "awe-inspiring" to describe the view of the mountain landscape that spans across four states. If fundraising efforts to build a new observation tower are successful, that experience will soon be available for all to enjoy. The proposed tower will straddle the state line between North and South Carolina, which is also the Eastern Continental Divide, as well as a segment of the Tennessee Valley Divide, the expansive watershed for the Tennessee River. South Carolinians can support the fundraising effort for the tower by purchasing memorial brick pavers engraved with the donor's name that will become a permanent part of the tower complex. Outdoorsman and frequent SCW contributor Dennis Chastain lives in Pickens County.